Have you ever wondered how to calculate the MPG of your new or used INFINITI? We have you covered, but before we talk about the calculation, let's talk about fuel economy and what it might be telling you. When looking to buy or lease an INFINITI vehicle or any vehicle for that matter, fuel economy should be considered before purchase as an added factor in the overall monthly costs. A general rule of thumb, the bigger the vehicle, the worse gas mileage is. Of course, this can change if the car is electric or a hybrid. For example, the 2018 INFINITI Q70 Hybrid 6 cyl, 3.5 L, Automatic (S7) gets a combined city/highway of 30 mpg whereas the 2018 INFINITI QX80 4WD 8 cyl, 5.6 L, Automatic (S7) gets only combined city/highway of 15 mpg. So given a gallon of gas, the Q70 Hybrid can go twice as far as the QX80, which certainly add up over time. Most INFINITI vehicles calculate the vehicle's MPG and display the value on the driver's dash. That said, sometimes doing your own calculation ends up being more accurate. 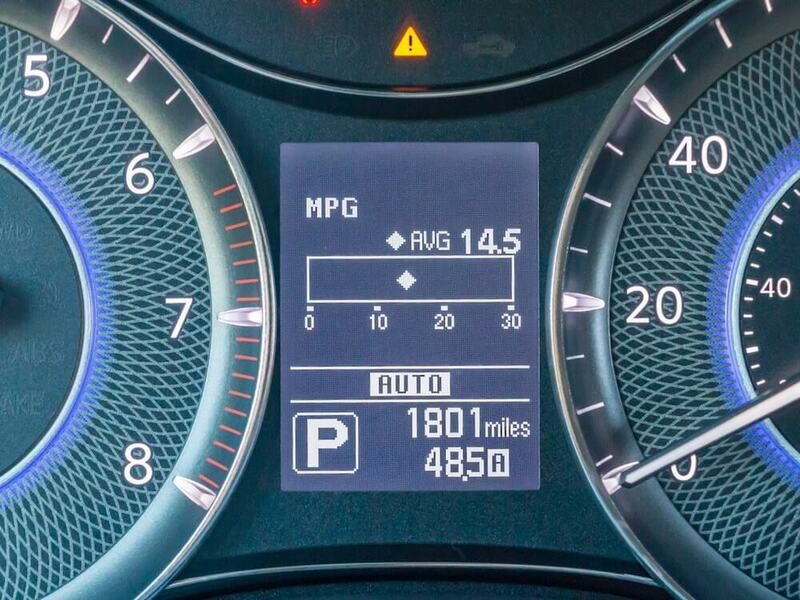 Calculating your INFINITI's MPG is a relatively straightforward calculation. When filling up the gas tank again, record the number of miles driven and the number of gallons needed to fill the tank. Having a small notebook to record the information is helpful. Over time you should get a good sense of how many miles your INFINITI gets per gallon. If you find that your vehicle is getting irregular mileage per gallon results, it could be a sign that there is an issue with the engine or fuel lines. If you suddenly see a drastic drop, you may want to take the vehicle to your local INFINITI dealership.